Belatedly, I've removed the links to download various software packages I no longer support. (I no longer support any of the software described on this site, but I've left innocuous things like widgets available even though they don't work quite right in El Capitan.) Eventually, I'll update the text to make clear what software is not available for download anymore. Development for the Mars Themes software will not be extended to support Mac OS X Mavericks, as Leland Scott explains in a brief blog article. Both CCI and Crystal Black have been updated for Mac OS X 10.8.5 when it's released. The new versions also can be installed and uninstalled safely on the developer preview (only) of Mac OS X "Mavericks," though they do not incorporate Mavericks system graphics. Crystal Black 1.6.5 was recently released with an incorrect uninstaller for Mac OS X 10.8.4. The correct uninstaller has now been incorporated into the download for CB 1.6.5. If you downloaded an earlier version of 1.6.5 and have an uninstaller that doesn't work on 10.8.4, you may download the updated one here. Both CCI and Crystal Black have been updated to add support for Mac OS X 10.8.4 when it is released. This release adds support for Mac OS X 10.8.3. It also disables CCI automatically for Photoshop on Mountain Lion. Icons to decorate your system files, documents, and applications. Free Crystal Black skins for iTunes, CoverSutra, and more. A collection of useful Dashboard widgets. ShapeShifter themes for Mac OS X 10.4 ("Leopard") and earlier. Some lovely designs for your Mac desktop. Free software utilities for text editing and optimizing the Apple Mail database. Alert styles for the Growl notification system, and a few other goodies. Over the years, the designers and programmers here on Mars have come up with a slew of cool ideas, designs, and software. What started out as intrigue about the possibilities of changing the look and feel of the Mac OS X interface, "Aqua," turned into a raging passion. At the same time, our experience in web design and development made working on Dashboard Widgets and other HTML-based desktop apps a logical endeavor. While developing one theme in particular — then known simply as "Crystal Clear" — we discovered a way to incorporate transparency into Mac windows. 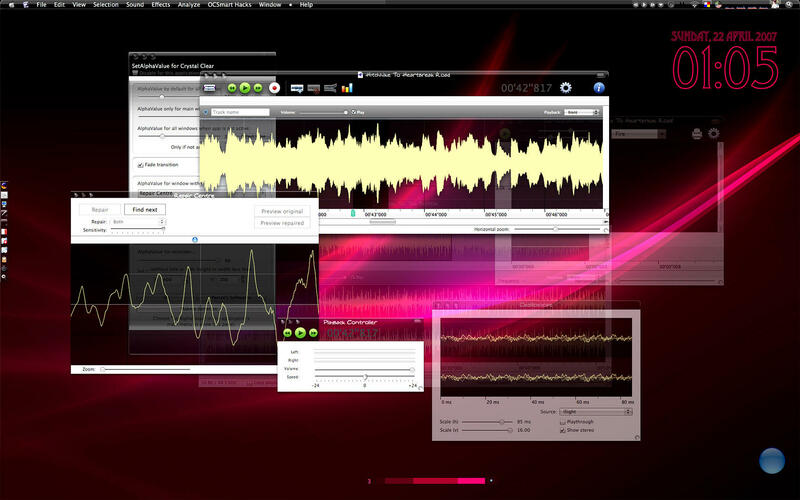 The technique involved use of a small Cocoa plugin called "SetAlphaValue." The use of this plugin gradually led us up the rather steep learning curve for the main software architecture behind Mac applications: Cocoa. While learning Cocoa, we've also dabbled a bit in AppleScript, Unix shell scripts, and other languages... and this work produced some little apps as well. Meanwhile, what started out as a design challenge did not diminish. Some Martians turned their talents to icon design, and others to developing images for decorating the desktop. What none of us anticipated was the strain that working with such teeny-tiny graphics would place on our eyes. Martians have particularly keen vision, but the strength lies mostly in identifying distant objects — such as Earth. By contrast, working on icons, buttons, and other widgets that can tweak the Mac interface requires pixel-level attention. Although design tools easily enable one to zoom in on such objects, one still needs to be able to take in the whole object at actual size. We can do it, but boy do we get headaches! Most of the downloads on the MarsThemes website can be used freely, but our two latest (and most complex) software tools — CrystalClear Interface and Crystal Black — require a license after the trial period. These icons can be used to replace the default "system" icons for folders, devices, toolbar items, Finder sidebar items, and others. I designed the icons for use with Crystal Black, but tried to make them compatible with the default Aqua theme. They'll look best with dark backgrounds, but light backgrounds will work too. The November 2011 release includes a small application for installing and uninstalling the Clear Crystal icons for users who don’t have icon-management software such as CandyBar. The application also manages a substantial set of system icons that CandyBar doesn’t, most of which are new to the set. the July 2012 update adds five more sidebar icons for Lion/Mountain Lion. The disk image download includes the application, a Read Me file, an iContainer for Candybar users, and a browsable set of folders containing all the icon files. For more information about the Clear Crystal icons, have a look at the article that introduced them: "Introducing “Clear Crystal” System Icons for Mac OS X"
This is a set of 74 document icons intended to complement CrystalClear Interface and the set of Crystal Albook system and application icons I released in 2007. The set covers most of the document types used by Apple's applications as well as a limited set of document types for third-party applications. These icons are included as part of CrystalClear Interface and can be installed/uninstalled within that application. Here, you can download them separately and install using CandyBar. A brief article with more images is available on my blog. The Crystal Albook icons were designed to match the look of the Crystal Clear ShapeShifter theme. The set includes all the Mac system icons, as well as 49 application icons. Crystal Albook is based on Laurent Baumann's excellent Albook icons, which is generously released under the Creative Commons license. The Crystal Albook series incorporates transparency to accompany the Crystal Clear theme and its variants. It is available as iContainers for Candybar and as individual icon files for Mac OS X (in ICNS and PNG formats). The download includes all of my application icons for DeStyl, as well as Vanoppen's original set of system icons. I still love the DeStyl design, and very much hope I'll have the time someday to continue fleshing the set out. 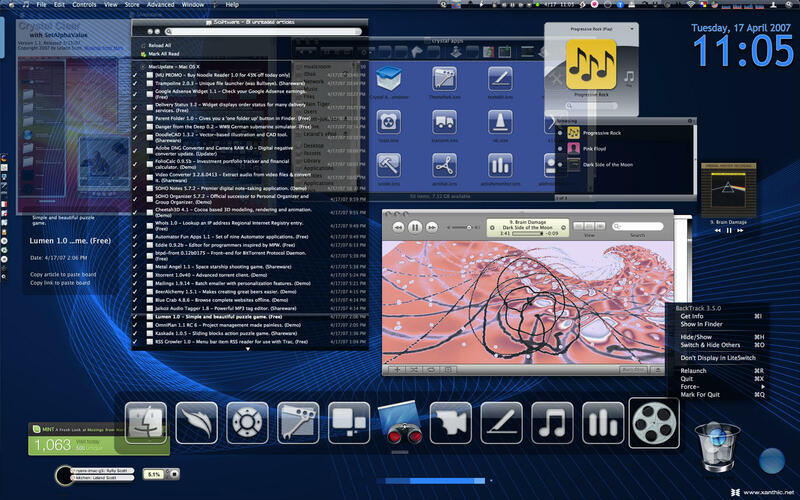 The following themes are designed for Mac OS X 10.6 ("Snow Leopard"). They cannot be used on earlier or later releases of Mac OS X. The themes consist of four files: ArtFile.bin, SArtFile.bin, Extras.rsrc, and Extras2.rsrc. These files are replacements for the default system graphics files and should be used only if you know how to back up and restore your original system graphics files. An installer for these themes is not available. Embossed Nickel is a port of the classic "Nickel-Cobalt" theme for ShapeShifter. It is only available for Snow Leopard, and I have no plans to tackle the arduous task of porting this to Lion. However, if anyone out there is up for a challenge, having the Snow Leopard art files will give you a good head-start. This theme will be incorporated into the next release of CrystalClear Interface as one of the button theme options. Before building CrystalClear Interface, I dabbled obsessively with designing Mac OS X themes that could be installed using ShapeShifter. Using the software ThemePark, together with ShapeShifter, developing and sharing themes was quite simple. Unfortunately, the advent of Mac OS X 10.5 ("Leopard") made ShapeShifter obsolete, so the themes on this page can only be installed by users of Mac OS X 10.4 ("Tiger") or earlier. Transparency in this theme is literally crystal clear, partly to demonstrate feasibility rather than ultimate usability. Besides ShapeShifter, Crystal Clear also requires the Cocoa plugin CrystalClear Interface, a version of which is included in the download package. A variety of other goodies, including a Growl Style, menu extras graphics, and complementary desktop pictures. Quicksilver Tunes incorporates the silvery gradiants from Quicksilver (its default Primer theme) with the cool beveled toolbar and LCD window of the new iTunes. Quicksilver Tunes was my first original theme, and built on some mods I had done earlier in 2005--deStyl Ruler and deStyl Grey. Those themes began my modification of Gerrit Vanoppen's deStyl icons, which continued into Quicksilver Tunes. DeStyl Ruler was my second theme for ShapeShifter. The first, DeStyl Grey, was finished in May 2005, and I pretty quickly jumped into DeStyl Ruler as a followup. Ruler was a theme designed by Susumu Yoshida, and my theme was based on an early version of Ruler. Like Quicksilver Tunes, DeStyl Ruler was took design cues from Gerrit Gerrit Vanoppen's deStyl icons, a version of which I included in the ShapeShifter .guiKit. (For more about the icons, check out the "Icons" section of MarsThemes. The theme also included an early version of the Schroder House desktop picture, which was greatly refined for Quicksilver Tunes. The Classic 45s Jukebox gives you Dashboard access to the Classic 45s podcast of great music from the archives of rock'n'roll and soul history. The podcast is updated every time the online jukebox at Classic 45s.com gets updated. The musical snippets sent out in this podcast represent the very best in all Rock'n'Roll and Soul genres, hopefully introducing listeners to nuggets they may not have heard before. Each description includes chart, songwriter, label, and other descriptive information, along with an image of the 45 record label. xCuts is a utility for looking up Mac OS X keyboard shortcuts. 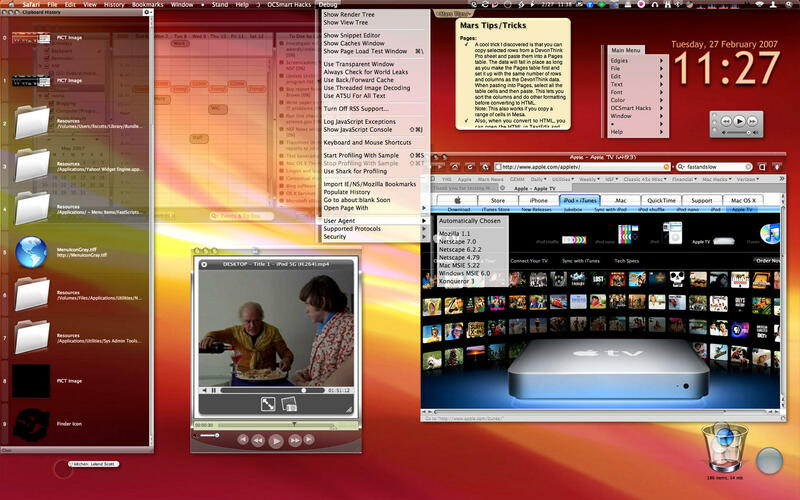 Besides its comprehensive set of Mac OS X shortcuts, xCuts also covers some other applications, such as Quicksilver. For more information about xCuts, refer to the April 2006 Mars article, "xCuts Dashboard Widget: Tripping The Light Script.aculo.us." The NSF Information widget for Dashboard presents the latest News, Funding Opportunities, Scientific Discoveries, and Publications from the U.S. National Science Foundation in a convenient tabbed interface. The widget is resizable and lets you define how much of each item to view at a time. For the full details, each Item is linked to the appropriate page on the NSF website. This widget lets Mac OS X customers of Classic 45s stay current with the daily changes in its inventory of classic 45 rpm records. It presents the website's RSS feed in an engaging interface that's even easier to use than RSS itself! For more information about this widget, see the July 2005 Mars article, "Anyone Can Develop A Dashboard Widget (And They Probably Will)." This set of 10 deskop pictures is part of CrystalClear Interface 2.6. The set is based on a Frank Lloyd Wright-ish design, with 6 dark variations and 4 light ones. All 10 images are jpeg files at a resolution of 2560 x 1600 pixels. Some of the black desktops are designed to complement the new Black Gloss window style, and others the new Smooth Black style. To download this set, click the button below the preview image. With CrystalClear Interface 2.2, I introduced a set of "frosted crystals" — desktop pictures designed to complement the eight new preset themes in CCI. These Crystals are still a part of the CCI download, but you can also download them here if you like. The look of frosted glass looks terrific when viewed through CrystalClear windows! I hope you enjoy using them as much as I have. My fascination with Schroder House started after seeing a print of it on Gerrit Vanoppen's website. I proceeded to meticulously translate that drawing into pixels, and then manipulated the elements in various ways. The original design was released with DeStyl Ruler, and the later designs were part of Quicksilver Tunes. Schroder House was designed in 1924 by Gerrit Rietveld in the Netherlands. To download this set, click the button below the preview images. AppMenu Magic is a small, simple application with only one cool trick: It replaces the application’s name with its icon in the system menubar. The functionality of AppMenu Magic has been part of CrystalClear Interface (CCI) and Crystal Black (CB) since those applications were first released. I am releasing the app separately because of continued requests for it. This app lets users take advantage of the improved appearance and reduced “screen real estate” of their menubar that AppMenu Magic offers, without having to use either CCI or CB. This application could hardly be simpler to use. Simply run the installer, and voila! No more long application titles consuming precious space in your menubar. In its place, you’ll see the application’s icon — which is usually much prettier than its title in any case. Version 1.3 slightly reduces the app icon size and fixes a problem that could prevent AMM from loading; version 1.2 fixed a permissions problem on one component, which was keeping some apps (e.g., Finder on Lion) from loading AMM; version 1.1 fixed installer to add a missing component, and to require logout after installation. For the full documentation on AppMenu Magic, refer to the User's Guide file that comes in the download, or the June 2012 Mars article, "AppMenu Magic Conjures A Simpler, More Elegant Menubar." The latest release — version 1.2.2 — is a maintenance update for compatibility with other MarsThemes plugins; 1.2.1 fixes a bug in the uninstaller; 1.2 fixed a bug and added an option related to hyperlinks. Version 1.1 added localizations for 13 languages plus English, and it filtered out a multitude of console messages that were set up during development. For the full scoop on the Mars Text Tools, refer to the Read Me file that comes in the download, or the January 2012 Mars article, " Text Tools for Mac OS X: Free At Last!" VacuumMail is an AppleScript application that performs an SQLite "vacuum" job on Apple Mail's database, thereby optimizing it and boosting the performance of Mail as it fetches and stores your email. VacuumMail is designed to be incorporated into an automated maintenance routine and run at regular intervals, although you can also launch the software interactively if you need to do a manual run. To enable automated operation, the VacuumMail installer includes a LaunchAgent that utilizes Mac OS X Tiger’s new launchd service. By default, the agent will run VacuumMail once a week, and the package includes the terrific open-source Launchd editor Lingon in case you’d like to customize that behavior. For more information about VacuumMail, refer to the ReadMe in the download, or the March 2007 Mars article, " Apple Mail Slowing Down? VacuumMail Can Probably Help." Most of these skins were built recently as extensions of Crystal Black. But I had earlier dabbled in skinning for Growl and the (obsolete) application iCan. The Crystal Black and related skins come with their own install/uninstall app. This little application installs the Crystal Black theme for iTunes. Separate downloads are available for iTunes 10 and iTunes 11. (The iTunes 11 implementation is very bare-bones.) To install, simply double-click the application and select “Install.” You'll need to authenticate as the admin user to proceed. You can use the app to uninstall the CrystalBlack theme as well. To uninstall, double-click the app and select “Uninstall.” The software can be used on Leopard, Snow Leopard, Lion, and Mountain Lion. Be sure to use the correct download for your version of iTunes. For more information, have a look at the article on my blog, "Crystal Black for iTunes." For more information, see my blog article, "Dress Up Your Mac's Authentication Panel With Crystal NIBs". This download contains a little application that installs the Crystal Black theme for CoverSutra, a popular and wonderful iTunes controller. To install, simply double-click the application and select "Install." You can also use the app to restore the default CoverSutra theme. After installing or uninstalling the theme, you'll need to quit and restart CoverSutra for theme theme to take effect. Also included in the download is a folder containing CoverSutra's default (black) menubar icon, as well as a white alternative for those who use a dark menubar. This application adds a Crystal Black skin to Safari’s built-in Web Inspector tool. To install, simply double-click the application and select “Install.” You'll need to authenticate as the admin user to proceed. After installing or uninstalling, you’ll need to restart Safari. For more information about this skin, which is composed mostly of Cascading Style Sheet (CSS) styles, have a look at the in-depth article on my blog, "Theming A Web Page With Crystal Black: A CSS Design for Web Inspector." Note: This skin has not been updated for Safari 5.x. This was my first investigation into making Growl themes, an experience I wrote up in the Mars article, "What If Growl Displays Were Just Little Web Pages?." I made this Growl style to go with the ShapeShifter theme of the same name. It is now included with the Crystal Clear install program, but you can download it here separately. Note: The download is an updated version of the Crystal Clear growl style from December 2007, courtesy of Michael Tughan. The update has several improvements--most notably, the ability to handle Growls of more than 2 lines. iTunes 11 is a radical redesign of this critical app, and it's all largely for the better. However, it plays havoc with Crystal Black users who uninstall and find their iTunes all messed up. So, I've put together a quick update for Crystal Black and a new little app for installing/restoring iTunes 11 (you can find it on the Skins page). In Crystal Black, I've removed support for iTunes — because to extend support to iTunes 11 would have added another 20 MB to the download size, which is already very large. So, users will have to utilize the standalone Crystal Black for iTunes apps. But those who update to the latest release of CB won't have to worry about it overwriting iTunes files with the wrong version. Reduces the app icon size slightly and fixes a problem that could prevent AMM from loading. Incorporates relevant bug fixes from CCI 2.8. Adds a feature that lets users define custom window themes, as well as a new button theme ("Embossed Nickel") for Snow Leopard users. Also includes a variety of bug fixes. This release fixes a bug in the uninstaller that affects users of Mountain Lion 10.8.2. Embossed Nickel is a port of the classic ShapeShifter theme "Nickel-Cobalt" for Snow Leopard. You can download the files from the Themes page. This release adds bug fixes and updated system graphics files from CrystalClear Interface 2.7.8, and updates Crystal Black for Mac OS X 10.8.2. This release extends the "Glossy" button theme to Mountain Lion users. Also includes several significant bug fixes, including ones affecting Dropbox, Growl, and QuickTime Player (on Mountain Lion). The update also adds support Mac OS X 10.8.2 when it's released. This release adds the Smooth Black button theme and compatibility with Mac OS X 10.8.1 (the latest release of "Mountain Lion"). This release updates CrystalClear Interface to be compatible with Mac OS X 10.8.1 (the latest release of "Mountain Lion"). Crystal Black 1.5.2 adds updates and bug fixes from CCI 2.7.6 and fixes a couple of Mountain-Lion-specific bugs. It is now tested and working on Mac OS X 10.8. This update adds a whole new button theme to CCI's bag of tricks: "Smooth Black" joins the others to give you four complete themes in addition to Aqua. CrystalClear Interface 2.7.6 also includes support for the first release of Mountain Lion, and it squashes a large number of bugs. See the CCI User's Guide for more information. This update adds some more sidebar icons to the set for Lion/Mountain Lion. See the Icons section to download. Bug fixes: Updated component that does the Sparkle update check, fixed install of Notification Center statusbar icon on Mountain Lion and of custom graphic for Endicia, and fixed an error that sent unnecessary messages to the system log. This update removes support for Lion 10.7.3, adds support for 10.7.5 and tentative support for the developer preview of Mountain Lion. Adds 12 new menu extra graphics and incorporates enhancements and bug fixes from Crystal Black 1.5. This update includes some bug fixes and minor enhancements. It adds support for Mac OS X 10.7.5, and tentative support for the developer preview of Mac OS X 10.8. For details, see the Crystal Black Release Notes. Version 1.2 incorporates bug fixes in installer and in component permissions that could prevent apps from loading AppMenu Magic. Download from Software. AppMenu Magic is a new app from MarsThemes with one simple, useful trick: It replaces the application name with its icon in the system menubar. For more info about this new shareware, see Software. Text Tools version 1.2.2 is a maintenance update for compatibility with other MarsThemes plugins. See Software. I've updated the xCuts database of keyboard shortcuts for Mac OS X to add Lion Recovery and other newer items. You can find the xCuts widget on the Widgets page. This is a major update that includes several new features, as well as numerous enhancements and bug fixes. It drops support for Mac OS X 10.7.3. For details, see the Crystal Black page. This little application provides two alternative styles for the “Authenticate” panel that appears whenever you’re required to enter a password on your Mac. It works by substituting different “NIB” files — the files that define the window’s interface — for the default system versions. For more info and to download, visit the App Skins page. This update makes a few minor enhancements to version 1.3, released last week. To download, visit the App Skins section of the site. This update themes iTunes 10.6, as well as earlier versions back to 10.1. To download, visit the App Skins section of the site. The Systems Graphics for Crystal Black application has also been updated. It now supports Snow Leopard and Mac OS X 10.7.4. This update to Crystal Black adds support for Mac OS X 10.7.4 ("Lion"). It also includes several other significant new features, enhancements and bug fixes. For details, see the Crystal Black Release Notes. The latest update to CrystalClear Interface is now available. The most significant change in this release is full support for Mac OS X 10.7.4 ("Lion"). It includes several other bug fixes and minor enhancements. For details, see the CCI User's Guide. CCI 2.7 is $15, but free for CCI 2.6 licenseholders and for CCI 2.5 licenses bought before May 10, 2012. This release expands and improves graphics for Lion and contains bug fixes, including a bug that could disable older versions of iTunes. The latest update to CrystalClear Interface is now available. The most significant change in this release is full support for Mac OS X 10.7.3 ("Lion") for the major upgrades introduced in CCI 2.6 for Snow Leopard. Today's update to Text Tools (v. 1.2.1) ensures that the MTLAgent is disabled if no other MarsThemes plugins are installed. The System Graphics app for Crystal Black was recently updated to support Lion 10.7.3. CrystalClear Interface 2.6 is a major release that introduces new graphics options for changing menubar styles, as well as incorporating the Black Gloss button theme from Crystal Black. As previously noted, this version is for Snow Leopard only. It is a free upgrade for existing CCI 2.5 license-holders. A new license is $18.00. All the details are now available on the CrystalClear Interface website. Work on CrystalClear Interface 2.6 is nearly finished for Snow Leopard, but despite best efforts and large amounts of work and time, the status for Lion is not looking good. I don't use Lion myself and don't plan to, and I don't want my Snow Leopard users to have to wait another couple of months while I bang my head on Lion. Already, updating CCI and Crystal Black for Lion 10.7.3 diverted work on CCI 2.6 for at least a month in January-February. Perhaps Mountain Lion will change my mind, but for now, CCI 2.6 will be available only on Snow Leopard. Of course, CCI 2.5 and Crystal Black will still support both Snow Leopard and Lion. CCI 2.5.8.8 was released today to fix a bug that prevented users from disabling individual apps from the CCI global menu. MarsThemes has updated both of its main theming software apps to be compatible with Mac OS X 10.7.3 ("Lion). As of CCI 2.5.8.7 and CB 1.2.4, the apps incorporate the system graphics meeded by 10.7.3. MarsThemes has released updates for both of its main theming software. The new updates — to CrystalClear Interface 2.5.8.6 and to Crystal Black 1.2.3 — add protection against installing or uninstalling them on Lion 10.7.3. The forthcoming version of Lion has yet another set of graphics files that are incompatible with the previous version. So until we can update the graphics for CB and CCI, you could mess up the appearance of apps by using Lion 10.7.3 together with CCI 2.5.8.x or CB 1.2.x. MarsThemes released a freeware app that finally provides easy access to the rich text editing tools built into Mac OS X. The core of this app has been available in both CCI and Crystal Black since the beginning, and it's now available as a standalone product. For more information and the download, see Software. An article on the Mars blog, "Musings from Mars," describes the new features in the forthcoming upgrade to CrystalClear Interface, CCI 2.6. In addition to listing the feature set, the article discusses some specific challenges the Martians faced in bringing the new features to life. This release adds an app for installing/uninstalling these Mac OS X system icons. Adds a special set for Lion, and numerous icons not managed by commercial apps like CandyBar. This release adds support for Mac OS X 10.7 ("Lion") up to version 10.7.2. Includes a small app for installing/uninstalling the graphics. You can download this release from Crystal Black's "Freebies" page. This release adds support for Lion 10.7.2, improves performance, and fixes bugs on both OS's. This update refines implementation of functions introduced in 1.2.2 and is particularly recommended for Lion users. Crystal Black for iTunes 1.2. This update fixes a couple of bugs in version 1.2.2. This release adds support for Mac OS X 10.7.2, further expands theming on Lion, and updates graphics for iTunes 10.5. .Mac OS X "Lion" version 10.7.2 introduces new graphics that are not compatible with earlier versions of Lion, nor with Mars Themes. Do not upgrade to 10.7.2 while running Crystal Black or CrystalClear Interface until we prepare updates for the new graphics.. This release fixes bugs on both Snow Leopard and Lion and adds graphics for Lion. This release fixes one major bug and adds several enhancements for Lion. This update contains enhancements, bug fixes, and improved compatibility with Mac OS X 10.7 ("Lion"). This release fixes bugs in using CCI on Mac OS X 10.7 ("Lion"). This is a maintenance release with two primary changes: Updated graphics for iTunes 10.4, and updated installer for awareness about CCI 2.5.8. This release fixes bugs related to the CCI Uninstaller and the License Installer. This is a major release that introduces a new architecture for the software and drops support for Mac OS X 10.5 ("Leopard"). It includes a variety of new features, though many are a bit subtle. In addition, the update introduces numerous enhancements to performance and usability. This release updates the system graphics files to include files for Mac OS X 10.7 ("Lion"). This release contains a variety of enhancements, new features, and bug fixes. For the full list of changes, refer to the Crystal Black User's Guide. These icons can be used to replace the default "system" icons for folders, devices, toolbar items, Finder sidebar items, and others. Though designed for use with Crystal Black and will look best with dark backgrounds, they are compatible with the default Aqua theme and light backgrounds too. This release fixes a couple of bugs in CCI 2.5.7, and introduces one new option. This release improves stability, addresses several bugs and other issues, and introduces some minor enhancements. Note: This will be the last release of CrystalClear Interface for Mac OS X 10.5 ("Leopard"). This was the first release of the ground-breaking theming software Crystal Black, an offshoot of CrystalClear Interface. Crystal Black was released for Snow Leopard users only. An article about the theme was published on the Mars blog. Crystal Black for Web Inspector. This is the third of the pre-release utilities for Crystal Black. All three are bundled into Crystal Black 1.0. This utility consists mostly of CSS styles, and themes the web inspector tool built into browser built with the open-source WebKit (including Safari and Chrome). See the article about the utility on the Mars blog. This is the second of the pre-release utilities for Crystal Black, this one designed for theming the iTunes controller CoverSutra. See Mars blog article for more info. This is the first of three pre-release utilities for Crystal Black, this one designed for theming iTunes, versions 10.1 - 10.4. See Mars blog article for more info. This release fixes a few bugs that can have a noticeable impact on window and view display. This major release, a free upgrade for all users, includes a variety of new features, enhancements, and bug fixes. The new features only apply when running CCI 2.5.6 on Snow Leopard. This update introduced a large number of new features and enhancements, including a significant expansion in tools available from the CCI global menu. This major release finally made CCI work on Snow Leopard, and introduced numerous enhancements. An article on the Mars blog describes the whole ordeal of "Taming A Lion in Winter." The Crystal Black Theme provides superior usability for its glossy black interface elements. The elements themselves are beautiful, but not practical without the underlying software that makes the theme work. Why Use A WebKit Browser? Besides saving development time, this also means fewer graphics, less code, and less download time. If you're using an older version of Safari, or of Firefox, Opera or IE derivatives, come back and view this site with WebKit or a WebKit-based browser such as Safari 4.0, Safari 5.0, or Google Chrome, or with your iPhone, iPad, or iPod Touch.